So you want to be a freelance copywriter. Of course you do. Who wouldn’t? You get to do something you’re good at, be your own boss, work from home, and (fill in other benefits of being self-employed). But how do you do it? How do you start that process and become a freelance copywriter? Here are the first six things I did when I got started (after I bought and read The Well-Fed Writer, that is). Maybe you got laid off from your staff position and want a change, maybe you need more flexibility in your work life, or maybe you just plain want to be a writer. Whatever your reasons are for seeking this career path, put your stake in the ground and claim it. Repeat after me: “I am a freelance copywriter.” Say this twice daily for a week. Say it to yourself and to others. Business writing, ghostwriting (books, blogs, and social media posts, for example), advertisements, environmental writing, marketing, email autoresponders, white papers, food articles, stories for magazines, essays for journals, narratives, etc. There are so many different kinds of writing you can do! Knowing what kind of writing you want to do is important because it will determine the kinds of clients you pursue. To figure this out, you could ask yourself this question: “What do I enjoy writing?” Go with that. I would recommend writing out as long a list as possible of the kinds of writing you want to do. This list will prove helpful when it’s time to identify your ideal clients (which we’ll discuss in a later post). Also, you can write multiple kinds of copy if you like, and I would recommend this for those of you just starting out. There are arguments to be made for having diverse writing expertise (general marketing copy, for example), and then there are those that encourage niché specialization (only writing white papers). Over time, you’ll learn which way is best for you and your business goals. Résumé and samples, electronic and hard copy. I strongly recommend getting a hard cover binder together with samples of your work to show to prospective clients. Keep it current at all times. If this seems too archaic to you, by all means create an online portfolio that you can show off on your laptop or iPad while in meetings. Only very occasionally do I use the hard copy portfolio, but it’s best to be prepared. Prospective clients mostly request this information via email, and I send it as a PDF and/or refer them to the portfolio page on my website. Having an online portfolio is only a good idea. This way, prospects will be able to see your work at their leisure and you’ll have a very strong piece of your marketing to point to when you meet them. If you don’t have a portfolio page attached to your website, you can create one through websites like Carbonmade.com or Cargocollective.com. What should be included in your portfolio? Anything you’ve written that you would be interested in writing again and that showcases your abilities. If your portfolio is small, you might want to fill it out by doing some pro bono or speculative work. When I was getting started, I had very little to show for myself. I posted an ad on Craigslist offering to write content for free on the condition that I got to use the work in my portfolio. It worked. My first two clients came from Craigslist (and one of them even offered to pay me right away!). Your business name doesn’t necessarily have to be relevant to writing, but that would help. At least make it relevant to your personality. Here are some examples: Pivotal Writing; Knock Out Words; Enlighten Writing; and Gunderson Writing. Many writers just use their names like: Sheilaashdown.com, Lisanatalieanjozian.com, and Rachelhisakowright.com. Decide what feels good to you and stick with it. If you know anyone with relevant marketing skills, ask for their input. You can get a free blog/website from sites like WordPress.com, Blogger, or MyBlogSite. My website is through WordPress.org and I love it. (More on WordPress.com versus .org later.) Setting-up a basic website is pretty simple these days. If you want something a little fancier, a little higher end, consider hiring a web designer to do this for you. When it comes to your website, there’s no right or wrong way to do it. But there are plenty of strategies, tricks, and considerations. Look over the websites listed above and get an idea for the range of things you could do with yours. No, they’re not outdated. And yes, they are still very much a part of business. All the cool kids have them. I’d recommend printing on both sides. Because why not? Otherwise the back is just wasted advertising space. Stay tuned for more freelance copywriter start-up tips in future posts. I was cruising along in my freelance business until I read the book Breaking the Time Barrier. It rocked me. I wondered: have I been leaving money on the table all along? Breaking the Time Barrier discusses how freelancers price services. I had always heard a lot about the two primary ways to get paid as a freelancer: hourly or flat rate (and had already declared project rates to be the clear winner). But Breaking the Time Barrier presented a third, previously unknown option: value-based pricing. I was shocked by what I learned. This concept is explored in Breaking the Time Barrier using an interesting fictional story with many valuable lessons. Breaking the Time Barrier tells the story of a fictional freelance designer named “Steve.” Steve is a semi-successful freelance designer who has plenty of clients and has worked with a few big clients. But Steve is overworked. He’s also watched a company he’s freelanced for go on to great financial success while being stuck working for them at his meager hourly rate. Steve has gone through the struggle I and many other freelancers have: our time and available hours we can bill is finite. And competing on price means we’re stuck. Like many of us, Steve wonders if there’s more. They don’t hire me to design a website for the sake of designing a website. They hire me to design a website that’s going to help them grow their business. I find when I look at it like that— from their perspective—it’s clear I’m not selling time. Instead, I’m selling a solution that is going to make an impact for my client and achieve some business objective. Karen’s tactic isn’t a money grab, but a carefully constructed strategy she uses when she meets with potential clients and writes project proposals for them. The result: Karen gets paid multiples of what Steve earns for similar projects. At the same time, Karen’s clients benefit from her expertise beyond the role of just a freelancer. She doesn’t start with price. Karen knows potential clients shopping on price alone aren’t her ideal targets. Instead, she asks questions and explores her clients’ needs first. She asks clients what their desires are. Clients may say they want a new website, but what they really want is more sales. Karen makes sure to get to the bottom of this. She explores work outside the clients’ proposed scope. Once Karen knows her potential clients’ desires, she offers a solution to meet these needs rather than simply submitting a proposal based on the limited work they originally asked for. The key here is to think about what you can do differently to stand out, find out what clients really want, and offer them a solution that helps them meet their goals, while proposing a fee that’s in-line with each of these items. I’m the accumulation of all my skills and talents. I’m wisdom and creativity. I’ve stopped seeing myself as a punch card. My clients don’t see me that way either. Yes, sometimes, I’ve had to change my client’s mind-set. But it starts with me first, just as it starts with you. Don’t forget: clients are hiring you for your skills, experience, and expertise. These things take years to develop, and they don’t simply translate into the few hours you put into client work. Even though this idea of pricing on value hit me hard, the book points out it’s nothing new, nor unique to creative freelancers. Karen mentions a story of how a plumber she hired to make an emergency call to her home charged her $300 for about 10 minutes worth of work. And she didn’t complain or think he should charge less. The plumber offers a valued service and charges a premium fee for his work, and that work is valued by homeowners who need a fast solution to their plumbing problem. This is where the key for freelancers lies: Don’t charge based on value just because you simply want to make more money from your clients. Offer more value to clients in the form of specialized service that makes you stand out above your competition. This way, you’re certainly not competing on price alone and can justify higher fees when clients see the value you bring. Breaking the Time Barrier is honest: you can’t 100% make the leap to value-based pricing tomorrow. The book ends with Steve gradually making the transition until, months later, he finally lands a huge client at a lucrative rate and pushes his salary into six-figures. But you can get started tomorrow. The book invites you to think about how you can offer more to your clients and in turn command higher fees by providing greater value. I highly suggest checking out Breaking the Time Barrier, which is available as a free download. Have you tried a value-based pricing model for your freelance services? Why or why not? Freelancing has many plusses: Setting your own schedule, working a job you love (where you get to be the boss), setting your own hourly rate, and many, many more perks. One of the things that people do find to complain about is the lack of work companionship. This lack of work-friends sends many a freelancer to seek out writing groups like CC: PDX, and we are quite happy about that. Freelancers tend to come together in shared offices, too. Portland has a number of shared spaces, and if the Conclave gets its way, we will have our own space in the future. We all like the idea of pooling resources, and having a place to collaborate without having to “go to the office,” something that most freelancers dread the idea of. Freelancing has many twists and turns. I was fortunate to get a long-term contract last year, mostly on-site. It made me feel like I was going back on some of the basic tenants of freelancing; I would be working for someone again. One of the things I was looking forward to was being on a team again. I really enjoy working with people; it was always one of the things I liked most about working in restaurants and bookstores. There were times where personalities clashed, but there was always room for growth and understanding. I had some anxiety about going into an office style workspace, especially one that was so technical (I’m a technical writer, and this is a big company). I am a little, well; I don’t exactly fit into the traditional office environment. To calm myself down, I did a little research and came across an image that really resonated with me. I feel like it applies to freelancing and the more traditional office space working relationships. At any rate, it made me feel better about sitting in an office with the same people day after day. The idea comes from author, Neil Gaiman’s University of Arts commencement speech. 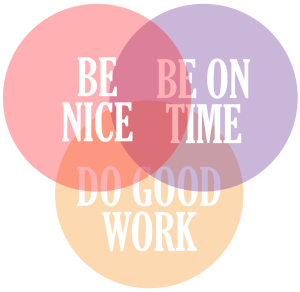 I try to adhere to all three circles, but if I had to choose two categories, as Neil Gaiman suggests most people fall into, they would be: I do good work and I’m nice. I tend to get lost frequently, so being on time is something that I slip up on. I might have a tendency to get distracted by projects and lose track of time too, maybe. You get work however you get work. People keep working in a freelance world — and more and more of today’s world is freelance — because their work is good, and because they are easy to get along with, and because they deliver the work on time. And you don’t even need all three. Two out of three is fine. People will tolerate how unpleasant you are if your work is good and you deliver it on time. They’ll forgive the lateness of the work if it’s good, and if they like you. And you don’t have to be as good as the others if you’re on time and it’s always a pleasure to hear from you. It was this bit of advice that I took to heart going into my on-site office job, and I have incorporated it into my freelance work. A last bit of advice from Neil Gaiman, “Go out and make good art.” It seems to me, that anyone looking to break into the freelance world can take these ideas into consideration. If you work onsite, in your home, in a shared office, or however you work, make good art (work), be nice, and be as on time as possible. I guarantee it will make your work life easier. I meet with a lot of existing and aspiring freelance copywriters in Portland. Sometimes they’re referred to me by members of the Conclave, sometimes I meet them at events, and other times we’re introduced by my creative staffing agency friends. However we find each other in this town, I end up giving them all similar information as far as where they can go to find good resources for networking and industry exploration. A few of my recommendations work for creative freelancers of all kinds, but I’m speaking specifically to freelance copywriters with this list. Copywriter Conclave of Portland (CC: PDX): A freelance copywriter support group that provides referrals and professional development for Portland Metro members. The Well-Fed Writer by Peter Bowerman: An award-winning book about how to become a successful freelance copywriter by a successful freelance copywriter. He also has coaching options, a blog, and a monthly e-newsletter that I highly recommend you sign-up for. I’m also interested to know about other great resources I might be missing out on. What resources have you found to be useful in your development as a freelance copywriter? Books, events, websites? Do share! A group of copywriters and editors in the same group may seem like a strange idea. After all, aren’t we supposed to be competing for the same pool of clients? If you’re a professional writer or editor in Portland (or you’re just starting out), that might be the first thing that comes to mind when considering membership in the Copywriter Conclave of Portland. When Amber James invited me to join the group back in 2011, that’s what I thought, too. The funny thing, though, is that I have gotten some of the best leads (and kind support) from this talented bunch of writers/editors. We do sometimes pitch to the same local clients. But it’s not a big deal. After all, we don’t just focus on the PDX area. For instance, I’ve worked with clients in Panama and China. Anyway, if a Portland client ever chose one of my peers over me, it’s because they needed a particular set of skills. Lisa-Natalie Anjozian writes for NASA (particularly the Goddard Space Flight Center). She also writes for small businesses, but not many writers can say they have written for NASA. Like Jeff Gunderson, she has a talent for taking complex concepts and making them understandable to everyone. Sheila Ashdown focuses equally on writing and editing (they require different mindsets, trust me). She has written marketing copy for Powell’s Books and numerous small businesses. She edits non-fiction and fiction books and offers multiple editing tiers depending on her clients’ needs. She is also the Editor-in-Chief of The Ne’er Do Well literary magazine. Dylan Benito currently works as a technical writer for Intel, a copyeditor for Oxford University Press, and she is also a freelance writer for local and non-local clients. She also spent several years as a bookseller for Powell’s Books. Somehow, she also finds time to be the Conclave’s treasurer. Kirsten Collins is a fundraising expert who offers a consultative approach to her clients. Her services include comprehensive grants management, as well as project-based grant writing. She even sets up grant plans and handles donor communications, making life as easy as possible for her clients. Jeanie Gosline currently writes copy for Nike.com and was a triple threat (proofreader/office manager/web coordinator) for Dissent Magazine during a critical four-year period (2004-2008). Her specialties include brand identity, web content, and marketing campaigns. Amber James, the Conclave’s founder and fearless leader, has written for Nike, and she currently is the copywriter for Biamp Systems. Oh, and she was also recognized by the NCAA as the greatest female athlete in the entire history of the Division III indoor track & field championship. She brings that same level of power to her clients. Kristin O’Neill excels at matching a writing style to a particular audience. Like Amber, she has a sports background, and she’s written content for many small businesses, as well as a construction firm. She also dedicates hours of her time to marketing the annual Wordstock Festival. Mike Russell is a web copywriter who has written everything from white papers to faculty profiles. He also gives prospects a free report entitled, “5 Ways to Write a Bio that Sells,” that provides tremendous value to working professionals. He also has a keen interest in environmental writing and unconventional pizza. Rachel Wright is a storyteller at heart and writes content that holds people’s attention. Her current focus is as a copywriter, editor, and content strategist. Her lucky clients include Nau, Roxy, and Nike. She’s also a talented and nuanced photographer. And then there’s me. I’ve written for the Oregonian and The Portland Spirit. I’ve created content for medical centers and physicians, and I’ve edited complete non-fiction manuscripts and novels. If you want to know more about the Copywriter Conclave of Portland, or you’re ready to sign-up, go here. We want to know more about you!